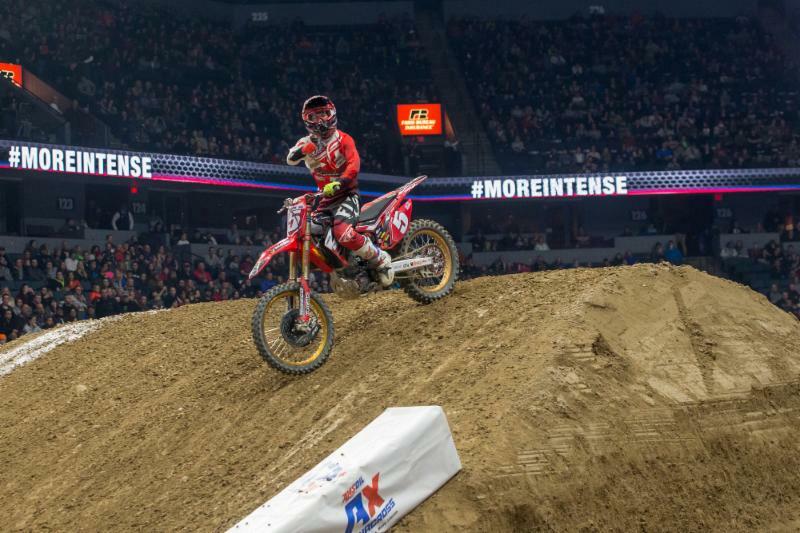 GRAND RAPIDS, Mich. (January 14, 2017) – The second round of the 2017 AMSOIL Arenacross season took place on Saturday night inside Van Andel Arena. After a dominant opening round one week ago TiLUBE/Jack Link’s/TUF Racing Honda’s Jace Owen was the rider to beat yet again, remaining undefeated in 2017 with his second straight sweep of the 250AX Class Main Events. In the Eastern Regional AX Lites Class, Motosport/Quick Roofing/Super Charged Energy KTM rider and championship leader Heath Harrison raced to his second consecutive win. 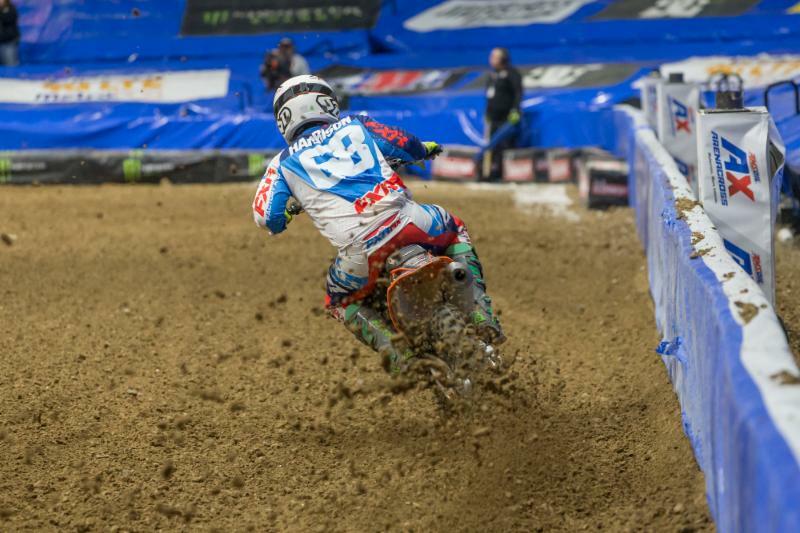 Owen swept the 250AX Main Events for the second straight weekend. Prior to the 250AX Main Events, the Rocky Mountain ATV/MC Head 2 Head Challenge appeared to serve as a precursor to the action that would unfold in the battle for the win as Owen and Team Babbitt’s/Monster Energy/AMSOIL Kawasaki, presented by AP Design rider Gavin Faith, the defending AMSOIL Arenacross Champion, squared off for the second consecutive weekend. This time Faith emerged triumphant, earning a pair of championship bonus points. The first Main Event saw Team Babbitt’s/Monster Energy/AMSOIL Kawasaki’s Jacob Hayes secure the holeshot over Owen and Rockstar Energy/OTSFF/Yamaha, in association with Cycle Trader and Rock River’s Chris Blose. Faith put himself in the mix as well, but went down in the second turn and dropped outside the top 10. Out front, Hayes pulled out a near four-second advantage over the field but had his hopes of victory erased after a crash off the catapult jump to start Lap 11. That allowed Owen to take over the lead and eventually secure the Main Event win. Blose followed in second, with his teammate Matt Goerke third. Harrison was fourth, with Smartop/MotoConcepts Racing Honda’s Cameron McAdoo in fifth. Faith fought his way back into the top 10 to finish eighth while Hayes recorded a DNF in 15th. Hayes did not line up for the second Main Event. When the second and deciding Main Event got underway Owen and Faith squared off again. Faith initially got the edge but Owen moved into the lead coming out of the whoops to lead Lap 1, closely followed by Blose in third. The lead duo remained tight through the opening couple laps until Faith crashed after the catapult to start Lap 3. He remounted quickly, but dropped outside the top 10. Blose then moved into second, with Harrison slotting into third. With a clear track ahead of him, Owen gradually pulled away and went on to capture his fourth straight Main Event win over Blose, with Harrison third, Goerke fourth, and McAdoo fifth. Faith ended up 11th. Blose earned a runner-up finish. Owen’s sweep of the Main Events gave his back-to-back overall victories. Blose bounced back from a difficult opening round to finish in the runner-up spot (2-2), while Goerke helped put both OTSFF machines on the box in third (3-4). Harrison finished fourth (4-3), with McAdoo rounding out the top five (5-5). Owen extended his lead in the championship standings and now holds an 11-point lead over Goerke. Faith, who finished ninth overall (8-11) dropped from second to third, 19 points out of the lead. Owen now holds a double-digit points lead. When the gate dropped on the Eastern Regional AX Lites Class Main Event it was Team Babbitt’s/GPF/Monster Energy Kawasaki/MMCR’s Jacob Williamson who grabbed the holeshot over Harrison and KTM rider Isaac Teasdale. However, as he looked to establish the top spot Williamson crashed out of the lead while navigating a rhythm section on Lap 2, allowing Harrison to assume the top spot. Yamaha rider Justin Cooper moved into second, with Teasdale settling into third. From that point on Harrison cemented his hold of the lead and took his second checkered flag of the season. Cooper followed in second, with Teasdale third. Williamson recovered from his early crash to finish eighth. 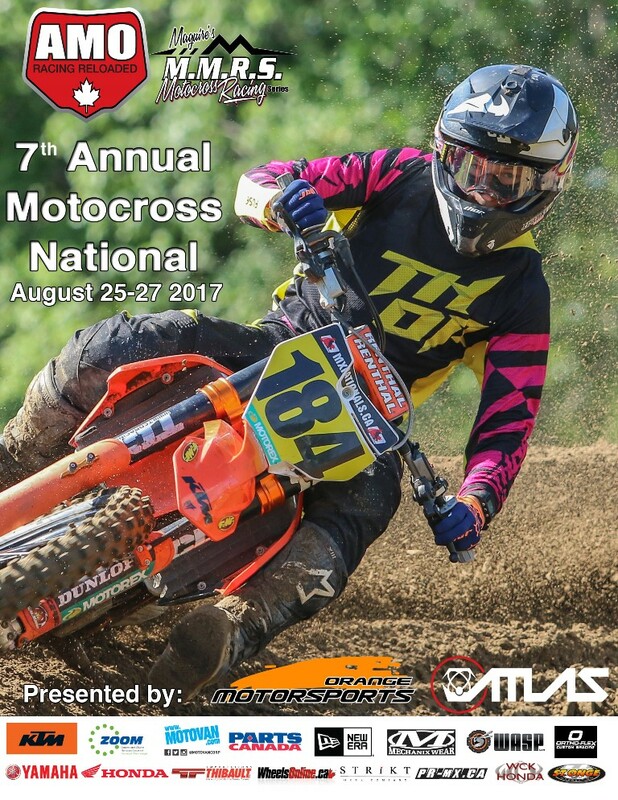 With his back-to-back wins Harrison now holds a four-point lead over Cooper in the Eastern Regional AX Lites Class standings. Williamson dropped from second to third, eight point behind Harrison. 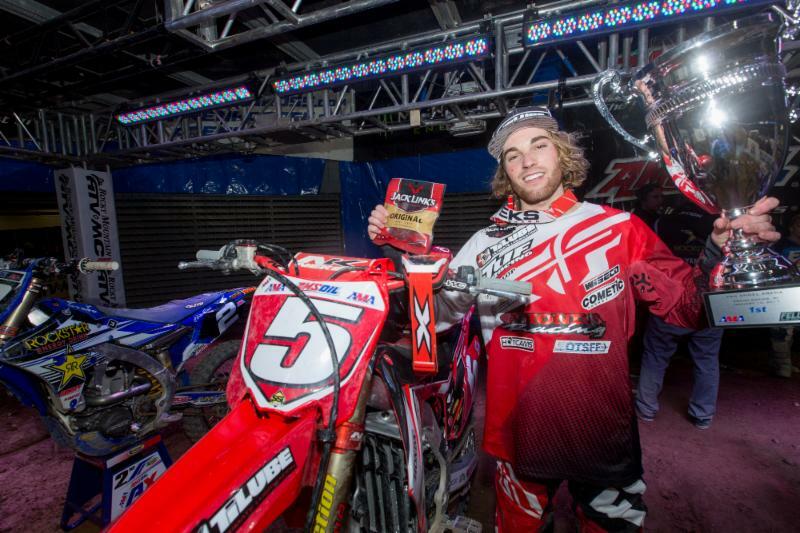 Harrison now back back-to-back AX Lites Class wins. 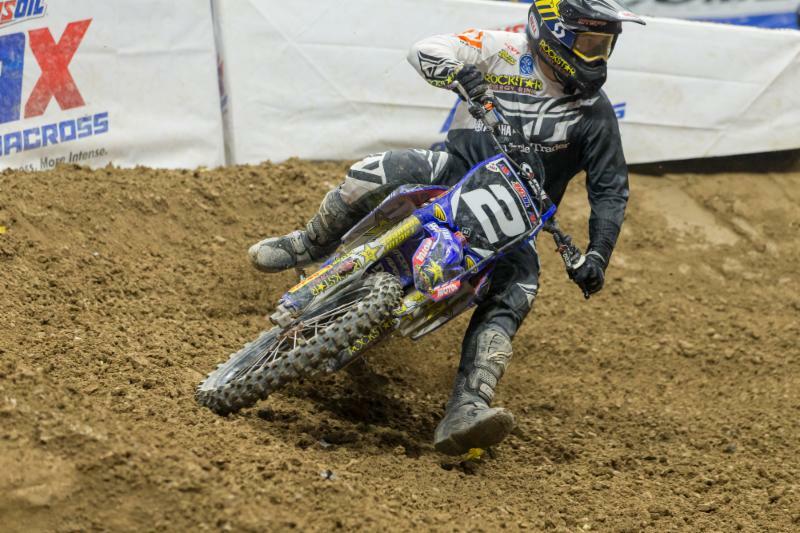 AMSOIL Arenacross will head to Baltimore next weekend for the third round of the championship from Royal Farms Arena. It will signify the first two-night round of 2017, on Friday, January 20, and Saturday, January 21. The action gets underway at 7 p.m. ET each night.